It’s been five days and soybean fields that were the greatest affected by the storm are now near-brown. Planting some type of cover crop in these fields can allow for grazing opportunities as well as reduced soil erosion as there are many months before planting season next year. 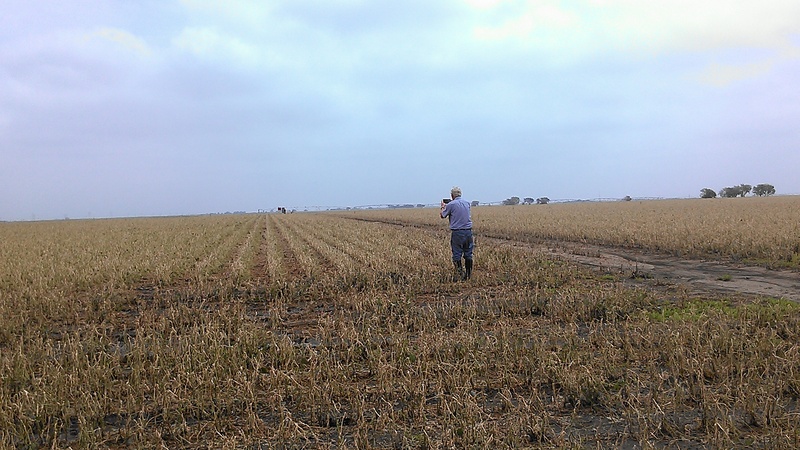 I’ll talk more about cover crop research in another post. 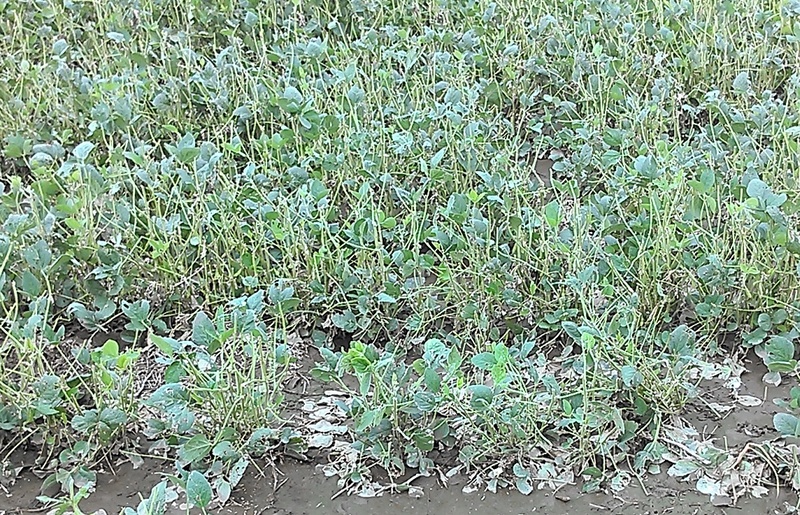 For fields that still have some leaves and some green to them, there are several criteria to look at when assessing hail damage to soybeans. These include determining plant stand, percent leaf defoliation, percent nodes cut off or broken over, and amount of stem damage. Determining percent leaf defoliation and subsequent yield reduction based on growth stage in indeterminate soybeans can be seen in the chart below. Most of our soybeans were between R4-R5 which is a critical time for yield loss in soybean. The remaining charts can be found here. Dr. Jim Specht, UNL Soybean Physiologist, shared some recent research data that may be of interest. He said R5 is also critical in that stem node number accrual (including new petioles with leaves and nodes on branches) ceases at R5. 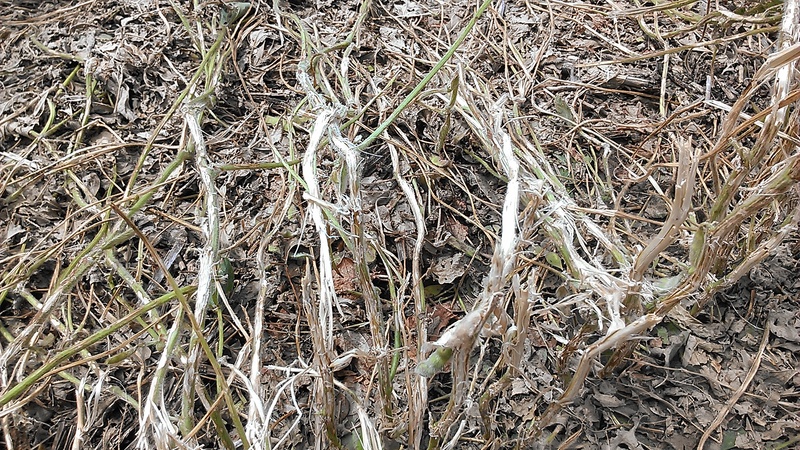 This occurs because the developing “sink” of newly developing seeds in the pods is a significant draw on the plant’s photosynthate. This draw is so powerful that very little other vegetative activity dependent on photosynthate is permitted. 1) Indeterminate main stem apices are not responsive to photoperiod induction, and might re-initiate new nodes, but since most of the indeterminate apical stem tips were hailed off in many fields, that possibility is unlikely. 2) During stage V0 to V1, all original lateral meristems in nodes 0 on up to about stem node 6 were cell clusters committed to vegetative phase development such as branches. Photoperiod induction, which occurs as soon as soybean plants of the maturity groups grown in NE attain the V0-V1 period, transduces in all other single-cell meristems in the lateral apices to become flowers (not branches). Thus the reason why we typically see the first soybean flower on about the 6th node or so. No more branches will form at higher main stem nodes the rest of this season under this scenario. Soybean lateral apices will continue to be programmed to become flowers, because the days are short at all times during the season from planting to maturity, for soybean varieties adapted to and sold in NE. Research has shown it takes about 28 to 32 days after the transduction of a lateral apical single cell (to transduce it into a floral pathway) before the flower tracing to that single cell appears. Any flowers appearing soon after the hailstorm would have had to have been cell clusters in transit before the hailstorm date (from a zero-day single cell transduction to a 28-32-day later observable flower). Thus, truly “new” flowers emanating from single-cell apical transduction to a floral state the day of the hailstorm would be appearing at the end of August or beg of September, and would not have sufficient time to become pods (with seeds) before the usual date of a fall frost. 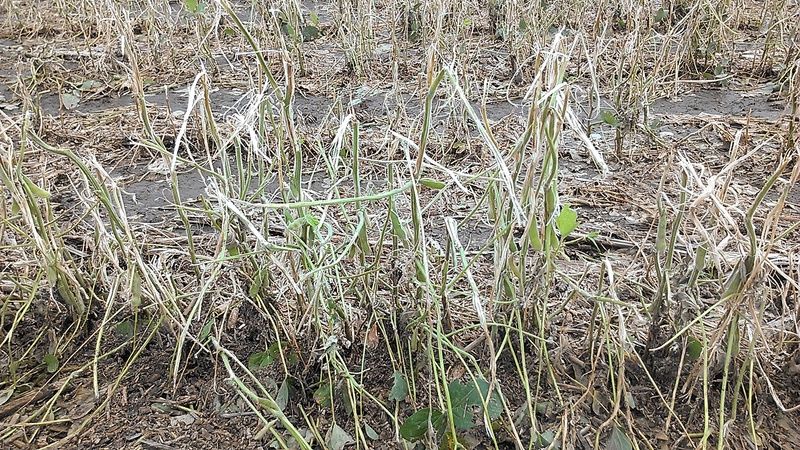 Overall, Jim says at soybean stage (R5), it is hard for a soybean plant to recover from a hailstorm, and what recovery is possible is going to have to hurry given the approach of fall. Special thanks to Dr. Jim Specht for his insights into this post! Posted on August 7, 2013, in Crop Updates, Storm Damage and tagged assessing hail damage, Crops, Extension, farm, farming, hail, hail damage, Nebraska, research, Soybeans, storm damage. Bookmark the permalink. Leave a comment.